The real federal individual income tax revenues collected in calendar 2018 were $9,312,450,000 more than the real individual income tax revenues collected in calendar year 2017. At the same time the Treasury was collecting record individual income taxes, the federal debt was climbing from $20,492,746,546,193.75 at the close of 2017 to $21,974,095,705,790.55 at the close of 2018. That was a one-year increase of $1,481,349,159,596.80. 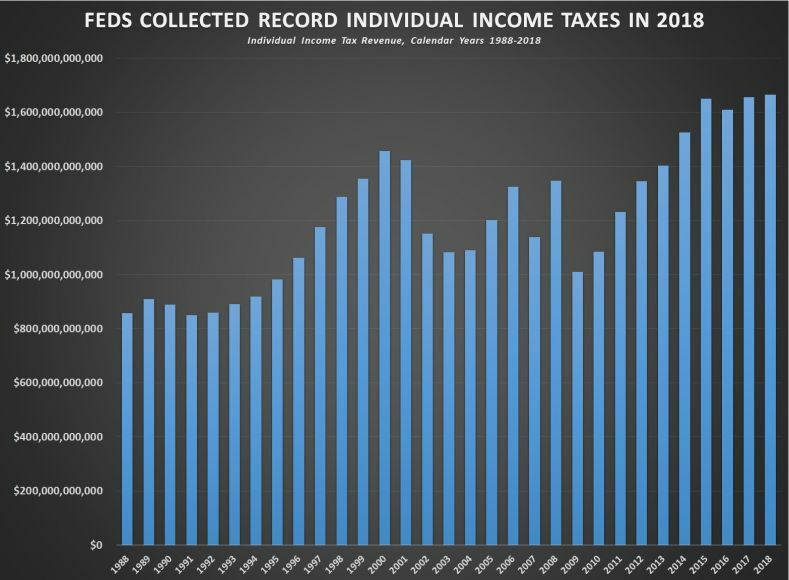 Even as inflation-adjusted individual income taxes increased from calendar year 2017 to calendar year 2018, total federal tax collections declined. In calendar 2017, total federal tax collections in constant December 2018 dollars were $3,407,503,740,000. In calendar year 2018, they were $3,330,470,000,000—a decline of $77,033,740,000 from 2017. Corporation income tax collections declined significantly from calendar year 2017 to calendar year 2018. In calendar 2017, the Treasury collected $290,978,980,000 in corporation income taxes (in constant December 2018 dollars). In calendar 2018, the Treasury collected $195,790,000,000 in corporation income taxes—a drop of $95,188,980,000. That was a decline in corporation income tax revenue of 32.7 percent. The Monthly Treasury Statements report federal tax and spending numbers for each month and cumulatively for the federal fiscal years, which run from Oct. 1 through Sept. 30. In order to derive the federal tax revenues for the calendar years, CNSNews.com used the cumulative tax revenues collected for the months of January through December in each year as reported in the monthly reports. CNSNews.com used the BLS inflation calculator to put the annual tax revenues in constant December 2018 dollars.